Principal cast: Frederick Stafford (Andre Devereaux), Dany Robin (Nicole Devereaux), John Vernon (Rico Parra), Karin Dor (Juanita de Cordoba), John Forsythe (Michael Nordstrom), Michel Piccoli (Jacques Granville), Roscoe Lee Browne (Philippe Dubois), Philippe Noiret (Henri Jarre). A desperate choice: Hitchcock began work on this film after the longest dry spell of his career, his previous film coming in 1966. Hitch had immediately begun work on another film (now referred to as Kaleidoscope), developing a screenplay and shooting some test footage. However, the studio execs nixed this film as soon as Hitchcock pitched it to them. After this rejection, he seemingly did nothing for about a year. Finally, with no projects in sight, he went to the studio and asked if they owned any properties that might work for him. And Universal suggested Topaz. This movie completes what I call the “frustrating Hitchcock” trilogy, following Marnie and Torn Curtain. All three films mix scenes that showcase Hitchcock’s technical brilliance, with scenes that are utterly banal. First off, let’s take a look at some of the elements of the film that did work. Then we will take a look at some of the things that were lacking. 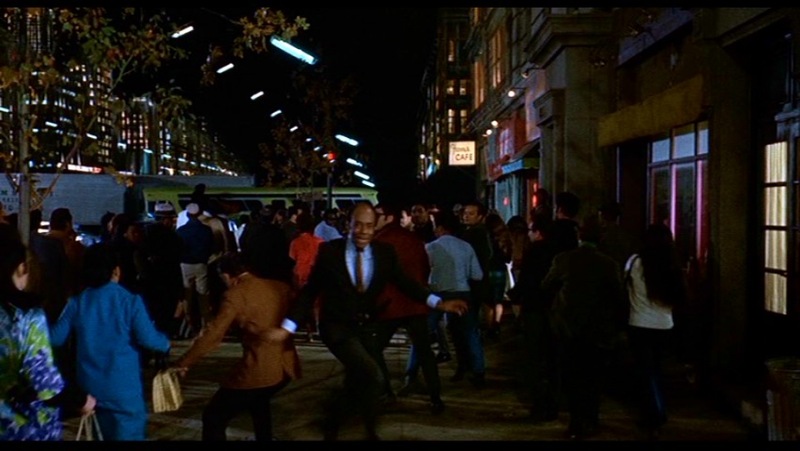 Defection, Hitchcock style: The film opens with a classic Hitchcock sequence. After the title sequence, Hitchcock opens on the Russian embassy in Copenhagen. A single camera shot goes from eye level, to a bird’s eye view as we watch a family exit the embassy, then goes to eye level again. This man is a Russian named Kusenov, who wishes to defect to the United States with his wife and daughter. 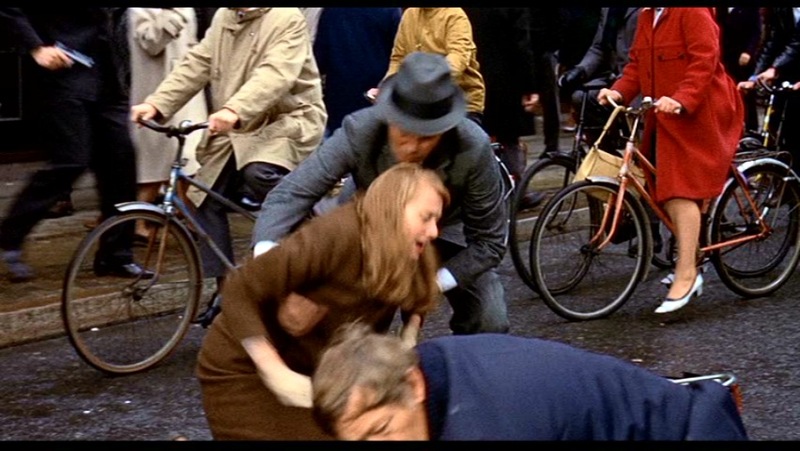 The opening sequence of the film details the Kusenov family’s attempt to defect as they are trailed by three KGB agents. 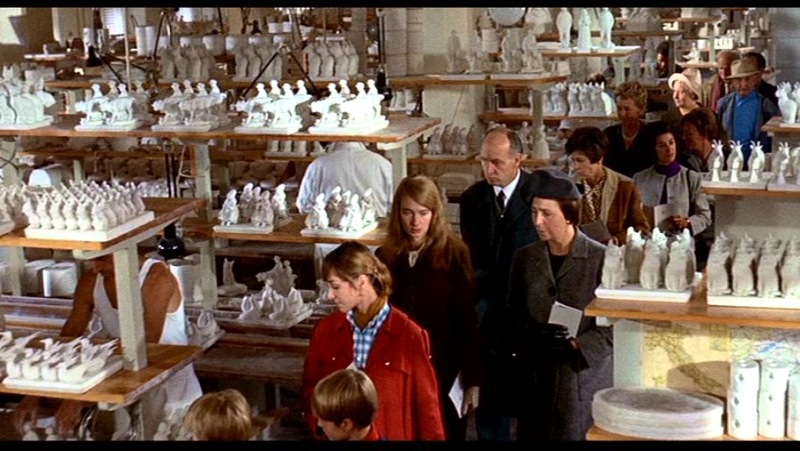 First they wander through a ceramics factory, then end up in a department store. It is outside this store that they barely make their escape. The American who aids in the defection and brings the Kusenov’s back to the US is Michael Nordstrom, played efficiently by John Forsythe. Ultimately, which begins with Russians and Americans, is really about French and Cubans. There is a spy in the French government who is in the employ of the Soviets. 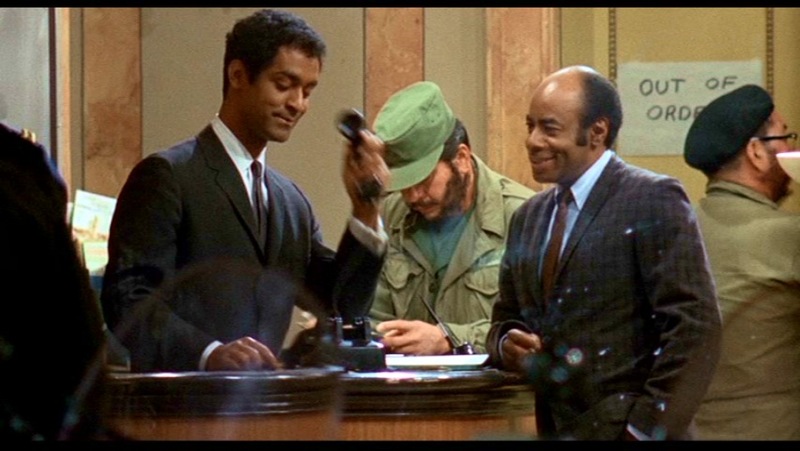 Michael Nordstrom’s French counterpart Andre Devereaux (Frederick Stafford) tries to ferret out who the spy is, as well as figure out what the Russians are up to in Cuba (the movie is set in the days prior to the Cuban missile crisis). 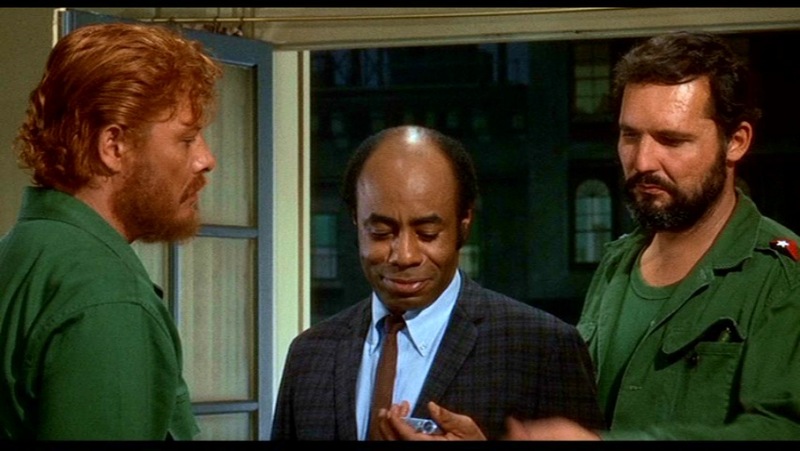 The best sequence in Topaz was the one outside the Hotel Teresa in Harlem, with Roscoe Lee Browne. There, you see, was a genuine use of the long-focus lens. Because, strangely enough, in real life, if you stand across a very wide street, you are able to single out two individuals and watch them and exclude everyone else. But if you were to do that on film, the eyes of the audience would never go where you wanted them to go. So I used a long-focus lens to single out the two principals to the exclusion of all else. The sequence begins with Devereaux meeting Dubois in his Harlem flower shop. They go inside a refrigerated room to speak, but the camera stays outside. Here is a technique Hitchcock used many times. 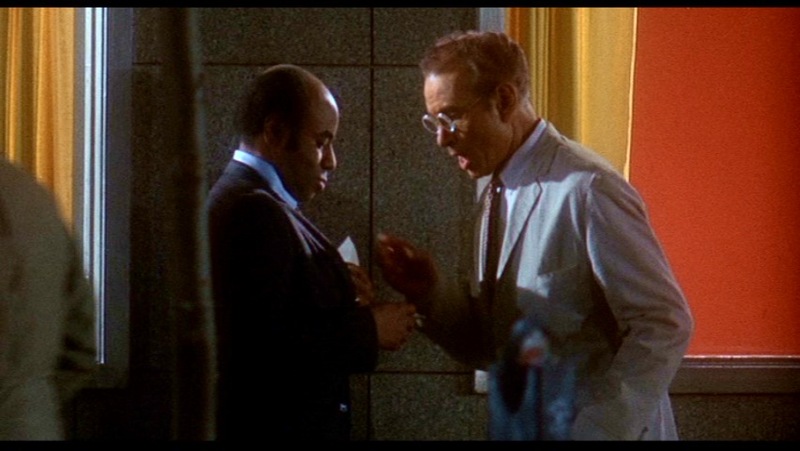 We don’t need to hear the conversation because we already know what Devereaux is asking Dubois; to obtain infomation from a Cuban named Luis Uribe. 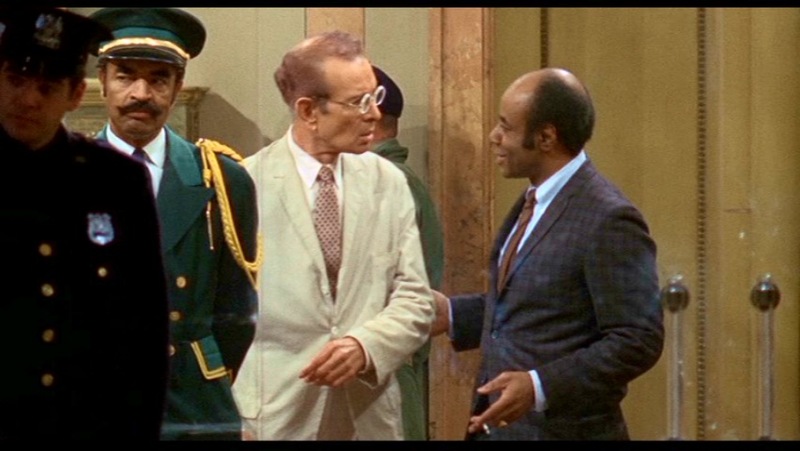 Later, the two men go to the Harlem Hotel where the Cuban delegation is staying. Devereaux stays across the street, and the camera stays with him. This is the telephoto lens Hitchcock was speaking about in the quotation above. Again, for several moments, we do not hear Browne’s dialogue. The audience along with Devereaux, is watching a silent movie. First Dubois enters the lobby and asks the clerk to call Uribe, who comes down on the elevator. We watch Dubois make a proposition, which Uribe refuses. Finally Dubois convinces Uribe to come outside, where he sweetens the pot, offering cash. This time, Uribe accepts, and the men go inside. Now the point of view shifts from Devereaux, as we join Dubois and Uribe in the hotel. The documents that Dubois wishes to see are in a briefcase in the room of a Cuban revolutionary named Rico Parra (John Vernon). First Dubois and Uribe discuss the matter in Uribe’s bathroom. Here Hitchcock cuts to a high camera angle, an angle he used in almost every film, usually to heighten the tension. 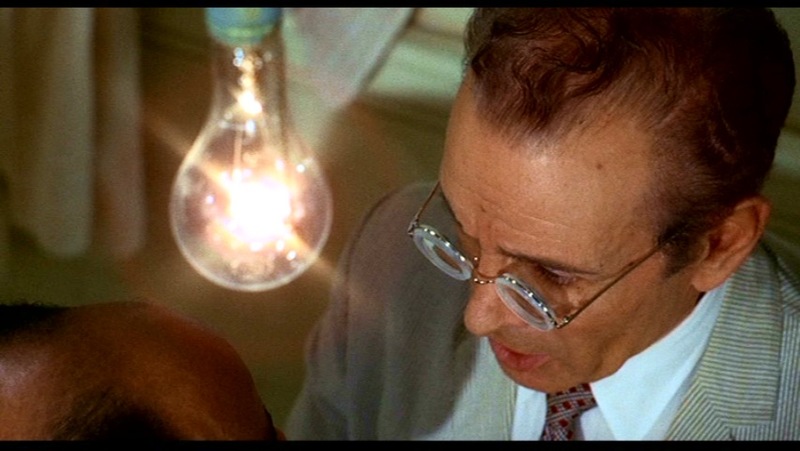 It is agreed that Dubois will talk to (and distract) Rico Parra while Uribe grabs the briefcase. They succeed in their plan, but soon Parra notices the briefcase is missing. Dubois makes a daring escape jumping out the window onto the awning below, and running down the street. After this fantastic sequence, the movie begins to slow down considerably in pacing, with the next section taking place in Cuba, and an even slower (and duller) section in Paris. A bleeding dress and a Pieta: Devereaux ends up in Cuba, where he makes contact with another spy, who he is also having an affair with. The affair was a large part of the book, and it features prominently in the film as well. The woman is named Juanita de Cordoba (Karin Dor) and Rico Parra loves her just as much as Devereaux does. Juanita’s network of spies get photos of the Russian missiles in Cuba, and Devereaux escapes with them, but things don’t go so well for Juanita and her spies. 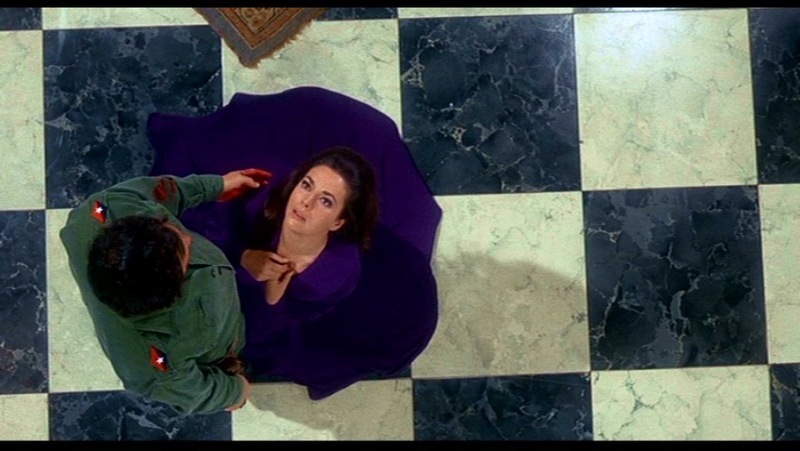 In the film’s most famous image, Juanita meets her end at Parra’s hand, and as she falls to the floor, her dress spreads out around her, simulating a pool of blood. And the spying couple that captured the photos meet a tragic end, after being tortured by Parra’s men. Here, Hitchcock returns to an image he used several times, that of the Pieta. This is his most deliberate, and most touching reference to the dead Christ in Mary’s lap. Hildyard and Jarre: Two men who were most closely associated with director David Lean worked on Topaz, and their solid contributions often go unmentioned. Cinematographer Jack Hildard was a master of color cinematography, who had won the Academy Award for David Lean’s The Bridge on the River Kwai. His interior lighting on this film is splendid, with several memorable images. Where Hildyard really shone, however, was on exterior shots. 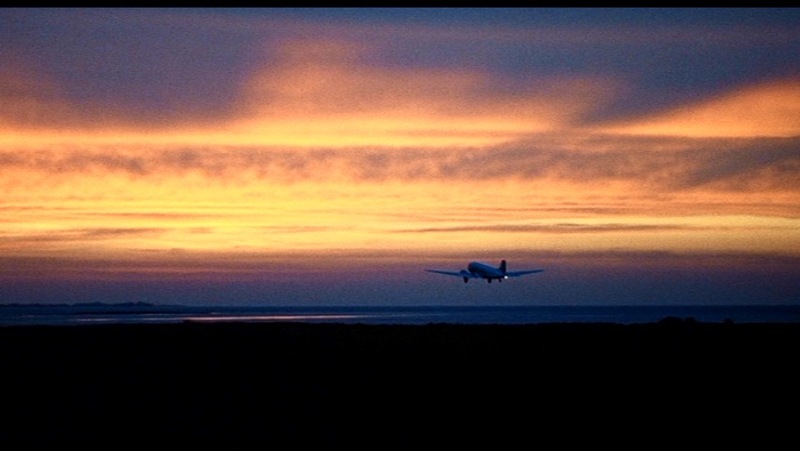 What might have been “throwaway” transitional shots for other DP’s became magical for Hildyard. And Maurice Jarre composed the musical score for this film. Jarre had won two Academy Award scoring movies for David Lean, Lawrence of Arabia and Doctor Zhivago. His score on this film is very engaging, sometimes even more so than the visuals. The score was one of the few things about this film that Hitchcock was happy about, and he hoped to work with Jarre again. Unfortunately that never happened. Topaz, for all its flaws, does have arguably the best post-Bob Burks cinematography, and the best post-Bernard Herrmann musical score of any of Hitchcock’s final four films. Languorous pacing: The final hour of this film is marred by slow pacing. Devereaux’s attempt to uncover the French spy simply drags on. There are a couple of good moments, but overall this stretch is overlong and unrewarding. 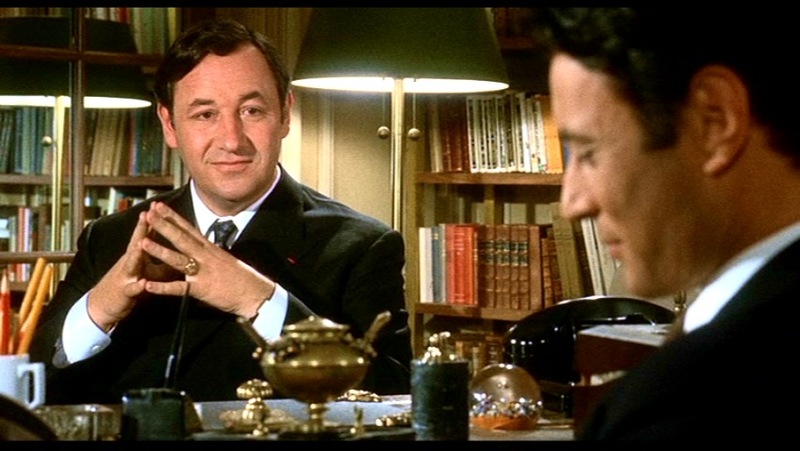 Philippe Noiret was an interesting choice to play one of the French spies, but most of the other Frenchmen are forgettable. The company took that out – they didn’t like that. 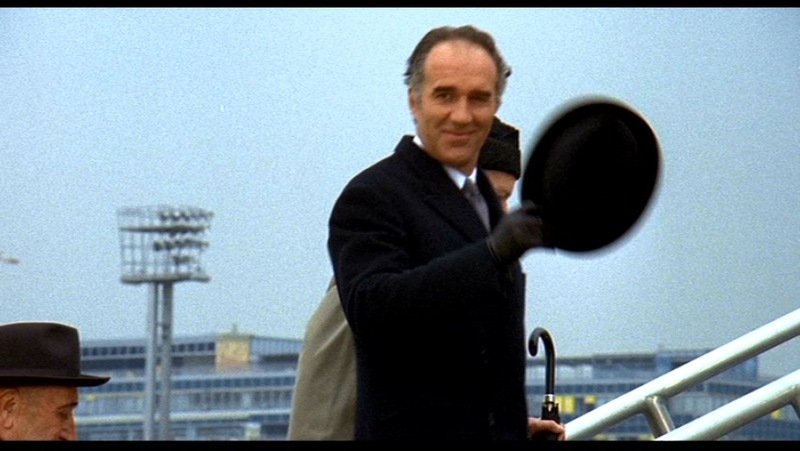 Put in an ending with Piccoli committing suicide. It was a compromise. I actually saw pictures of a duel in a very early edition of Paris-Match, I think, in which two men did meet in a football stadium. I thought that was a rather fascinating setting, instead of the usual dawn-in-the-woods with the low fog and the black-coated men with their top hats. That’s the cliche, you know. But to do a duel up against a sign which says “Dubonnet” or “Perrier Water” or whatever, I though was more amusing. I suppose it was a bit of self-indulgence. A second ending involved the Russian agent departing on a plane to Moscow, with a smug look on his face. The final choice, mentioned above by Hitchcock, involved a suicide. Unfortunately by this time the actors were all discharged. So a piece of footage of a different actor entering the Russian mole’s door was used, followed by a freeze-frame and the sound of a gunshot to imply a suicide. None of the endings work very well, but this is probably the worst of the lot. Performance: Most of the performances fall flat in this one. Frederick Stafford is a solid and capable actor, but he comes across as very wooden in this film, as do most of his compatriots. John Forsythe is solid in a supporting role, but he has little to do. There are two standout performances in the film however, both in smaller supporting roles. 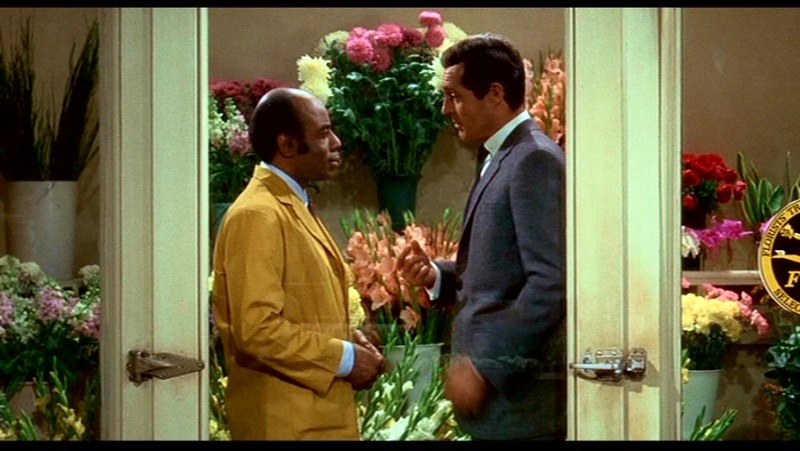 First of all, Roscoe Lee Browne as Dubois, the French spy working as a Harlem florist, gives a spectacular performance. And John Vernon, as Rico Parra, gives humanity to a role that was very thinly written. Source material: The film was based on the bestseller by Leon Uris. Uris was best known for Exodus, which had been a phenomenal hit in the late 50’s. This was a more modest success. The film maintains much of the story from the novel. One can imagine that a book involving both Cold Way spy intrigue and the Cuban missile crisis would have been popular in 1967; now, it all feels very dated. Uris struggles to balance the romantic interludes and arguments of infidelity with the moments of spycraft. The book suffers from the same problem as the film; some sections are engaging while others lag. Deveraux’s departure from Cuba is more fraught with danger in the novel, which creates great tension for the reader. 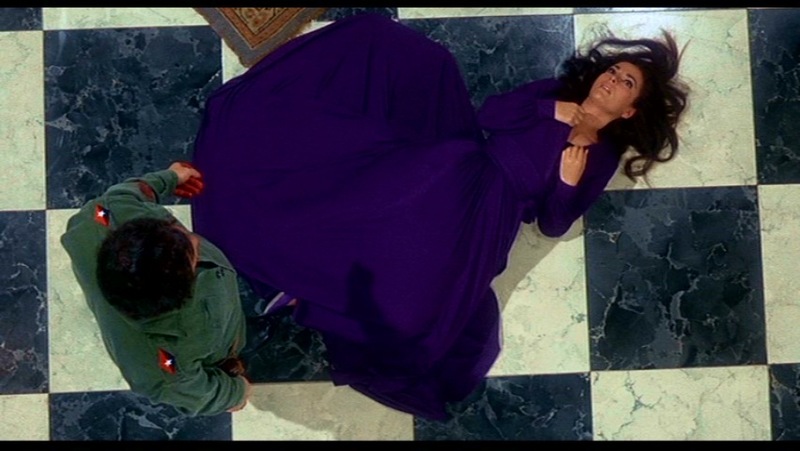 And Juanita’s demise is not nearly as poetic as the billowy dress of the film; she dies a bloody, violent death. 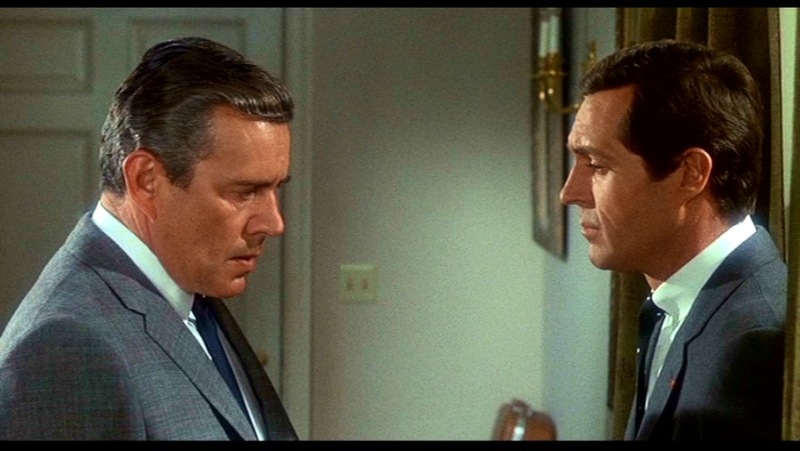 Recurring players: John Forsythe had earlier starred in The Trouble With Harry. 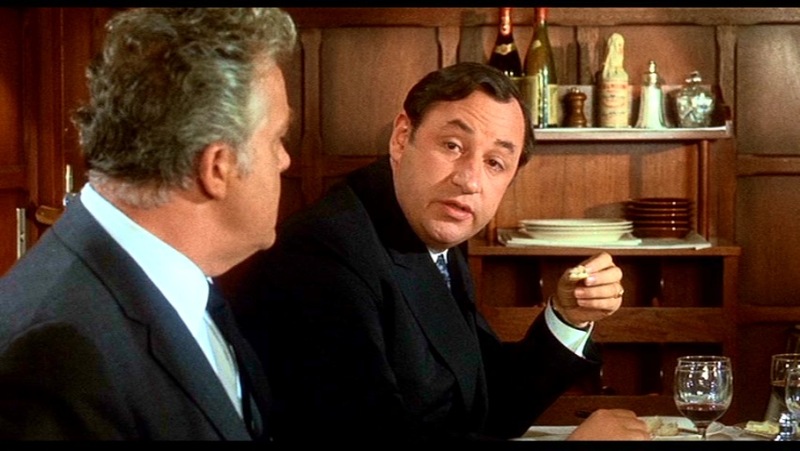 Lewis Charles (Pablo Mendoza, the man who takes the photos with his wife, is captured and tortured) had a small uncredited role in To Catch A Thief (he is the man who pours the bowl of milk and offers it up to John Robie in the early kitchen restaurant scene). 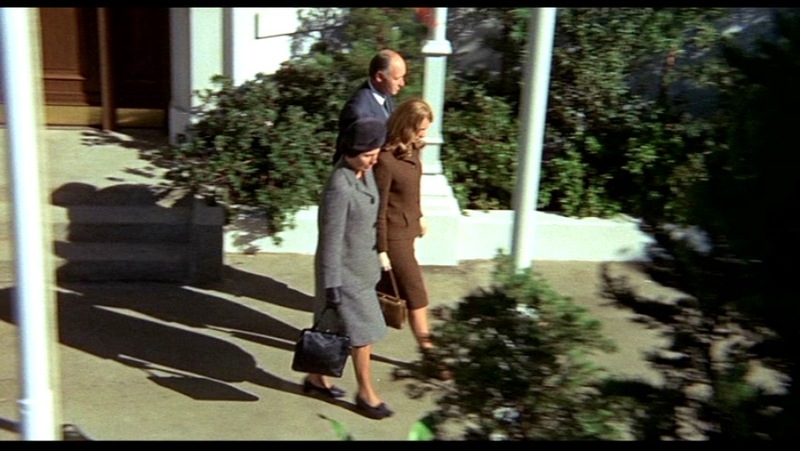 Hal Taggart (ambassador) had earlier appeared briefly in Marnie (man at racetrack). Where’s Hitch? Hitchcock’s cameo comes at about the 34 minute mark. In the airport scene, he is seen being pushed in a wheelchair by a nurse. The wheelchair comes to a stop, and Hitchcock stands up, seemingly in fine health, and shakes the hand of a man approaching from the right. Definitive edition: The Universal blu ray released in 2013 is the best version available. 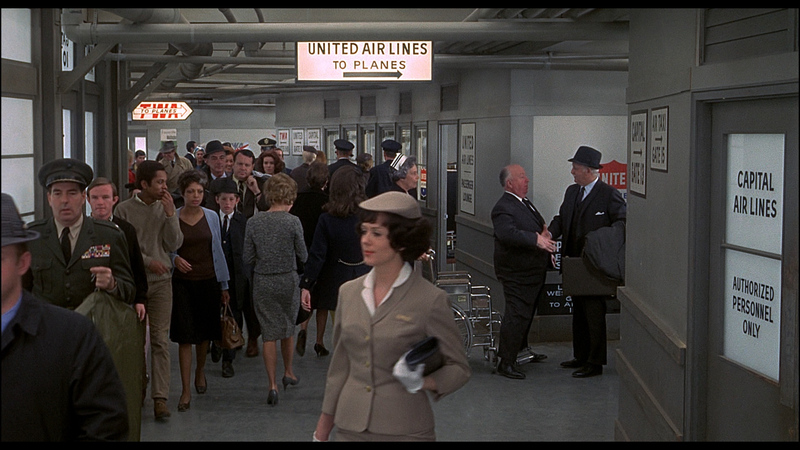 This print is not fantastic; a handful of Hitch’s later films could do with a clean-up. 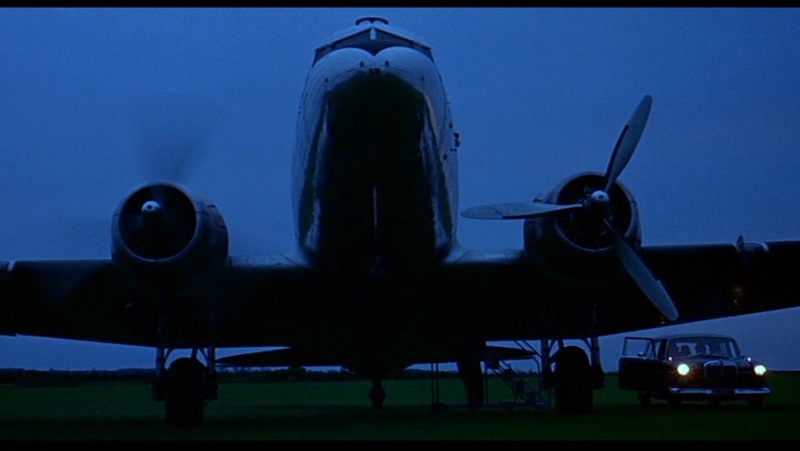 That being said, Jack Hildyard’s cinematography looks great in several sequences. The extra features include a half-hour documentary hosted by Leonard Maltin, which functions as a sort of apologist’s view of the film. Also included are all three alternate endings, a storyboard comparison, production photographs, and the original theatrical trailer.